I've heard a few people speculating that our rising national debt will inevitably cause our tax rates to go up. That seems to make sense doesn't it? I mean we can't keep piling up debt and then somehow magically not have to pay it back sooner or later. So it seems obvious that taxes could rise in the future in order to pay that debt. But taxes won't necessarily go up as a reflection of our national debt. There are 2 major factors that work for us as far as the future of the national debt: Inflation & Growth. Inflation. Over time inflation will make the amount of debt we have seem like smaller figure. As an example look at the debt we had as a nation after WW2. Back in 1946 our national debt was about $271B. That doesn't seem like all that much right now does it? Our debt sits at over $10 Trillion and counting. So the amount from 1946 is tiny by comparison. But back in 1946 that $271B was over 120% of our total GDP. So relatively speaking the national debt was higher then than it is now. Growing population base. As years go by our population grows and that means there are more and more people to spread the debt over. Lets look again at the debt after WWII. In 1946 the national debt was $271B and there were about 141 million people in the country. So that equates to $1921 per capita. Today there are over 300 million people. If we'd held that $271B for 63 years and did nothing but pay interest then it would be only $903 per capita. You could compare the national debt to paying off a home mortgage. You make payments for 30 years. The payments are fixed so over time as inflation increases prices the amount of our payment feels like less and less every year. Plus the size of our national household is growing so there are more and more people to help contribute to paying the debt. As you can see there is pretty much no direct correlation between middle class tax rates and the national debt. 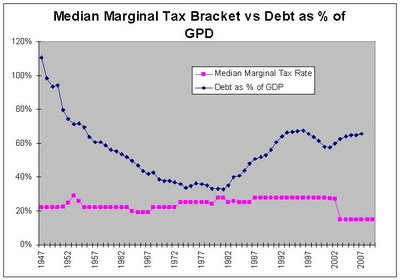 The national debt as a % of GDP has gone up and down and up over the decades but the middle class marginal tax level has not gone up or down proportionally. The tax rates have remained relatively flat over the decades staying in a range between 15-28%. I don't think there is any particular reason to think simply because our debt is going up that this will inevitably cause tax rates to increase in the future. I got the debt as % of GDP figures from Table 7.1 in the Historical Tables document from the Whitehouse.Gov site. I'm only showing the actual figures for the debt up through 2007 and I'm not including the estimated figures or most recent #'s. Should you get a new toilet to save money? Am I the Wealthiest personal finance blogger? Why is AIG so important? When it makes sense to build your own computer. Should you buy dental insurance? Is buying an Extended Auto Warranty a good idea?